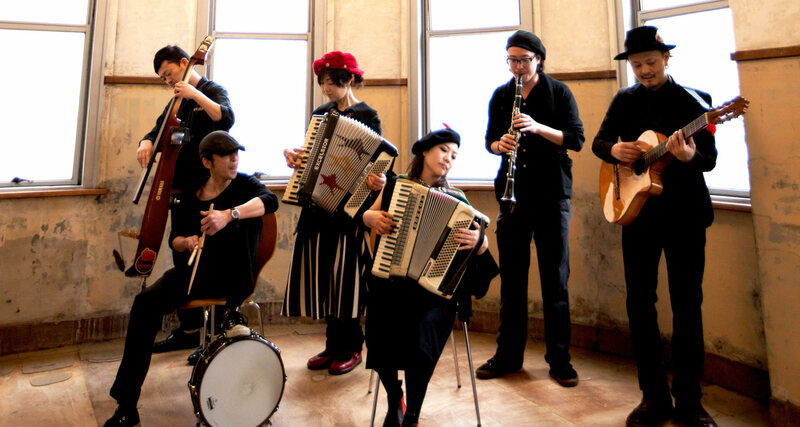 eltic blues” — a new kind of folk band from Japan. Combining the eclectic timbres of harmonica, fiddle, guitar, and percussion, Harmonica Creams fuses acoustics and electronics to create a unique sound. The distinct sensibility of Yoshito Kiyono, the Paris-based leader and harmonica player, amalgamates the aesthetics of chaos and harmony. We are The Emmanuelle Sunflower! 1999年冬、vo.&banjoのAtsushiLittle Fatsとwash boardのYokoyamaの2人で始めた。 当初は他のメンバーが 毎回違い、面 白半分でスタート。路上を中心に活動をしていくうちにメンバーが集まり、数回メンバーチェンジを繰り返して2005年1月初めに 今のメンバーとなる。 オリジナルCDアルバムは4枚発 売、小泉今日子他多数のレコーディングにも参加。路上からFUJI ROCK FESTIVALまで大小に関わらず数々のイベントに出演して好評を得る。 Wash board(洗濯板)とWash tub bass(洗濯ダライにモップの柄を立てワイヤーを張った ベース)が奏でる陽気なリズムに乗って、Banjo,Guitar,Violin,saxが唄う、極上の路上エンター テインメント! Rocking' female duo from Tokyo. Does authentic and wild rockabilly numbers from years ago. EL CAT is a ska band formed in Tokyo in 2012. The member consists of ten women. Okay, it is only woooomen! But CATS do not like the sweet music that kawaii girls play.We search for the deep and bitter and impudent SKA music.We love beer. We love to be pampered.